To be honest, I am assuming that these are board game figures because of the round bases on each figure. 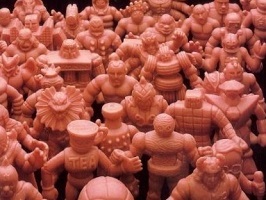 The figures themselves are early Kinnikuman sculpts which 95% of M.U.S.C.L.E. figures are from. I have 11 different sculpts. I assumed that is a complete set. How many different choices do you need for a board game? I do however, think there is another orange figure to make up a total of 12 (two of each color). The texture of these figures is identical to kinkeshi rubber. The color of the figures is where I think these get interesting though. I am certain I have seen these figures in multiple colors. If that is indeed the case, could there be six of each figure available? 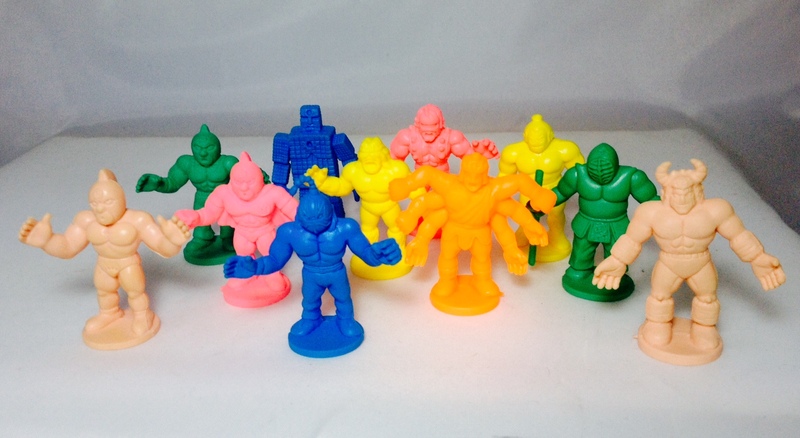 If so, I really like the orange figure as it is a color you never see in Kinnikuman. Pink isn’t seen that often either, mainly in bootleg figures. Could these be a vending machine bootleg? Comments, and any new insights, are very welcome this week! This entry was posted on Monday, October 5th, 2015 and is filed under UofM News. You can follow any responses to this entry through RSS 2.0. You can skip to the end and leave a response. Pinging is currently not allowed. Ive seen an Akuma Shogun sculpt as well!